There's no way to sugarcoat it, the 5 Series GT was that BMW ever built. Nevertheless, when we spotted a 6 Series test car that looked like a replacement for the GT, we knew BMW hadn't given up on it. We've seen that BMW's GT idea could work if done right, but now the 6 Series GT has been fully revealed and, well, we're not overly excited by it. The car looks like just like the 5 Series GT, but with the new styling language borrowed from the G30 5 Series. 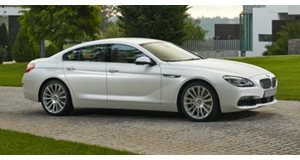 Using the longer, more elegant lines of the 6er, the 6 Series GT is an improvement over the 5 Series GT. But that wasn't such a challenge. The new car is based on BMW's CLAR platform, shared with the new 5 and 7 Series. The new GT will also receive the same semi-autonomous technology that those models currently have. It will be sold in the US exclusively in 640i xDrive trim, using the familiar 3.0-liter twin-turbo inline-six with 335 hp and 332 lb-ft of torque. An eight-speed Steptronic automatic transmission with paddle shifters sends power to the tarmac. 0-60 mph takes 5.1 seconds, which is slower than the sedan's 4.9 second time, but sufficiently rapid. 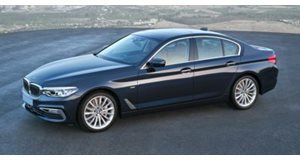 Where the 6 Series GT differs from the 5 Series is in cargo capacity, using a single-piece hatch, operated hands-free by kicking under the rear bumper. The GT offers 31 cubic feet of cargo space with the seats up (compared to 18.7 inches in the 5 Series) and 65 cubic feet with the rear seats folded, while the stretched roof provides rear passengers with 38.5 inches of rear headroom. 12 colors will be available along with a Luxury or M Sport package. The M Sport pack adds an aggressive body kit, a leather steering wheel, aluminum pedals and a choice of 19- or 20-inch wheels. The Luxury pack adds power recline to the rear seats. Active Driving Assistant features cameras, radars and a host of other sensors that constantly monitor the car's surroundings, feeding the safety systems such as blind spot detection, collision warning and lane departure warning. An optional Driving Assistant Plus package adds even further safety features including auto braking. Rear air suspension comes standard, while a Dynamic Handling Package adds air suspension up front. The air system can lift the car 20 mm and drop it by 10 mm, depending on whether you need some extra ground clearance or feel like chucking the car around a bit on some twisty roads. The 640i GT will start at $70,695 when it goes on sale this fall.